Submitted by Migrate Wizard on 2013-05-22 06:57. -=Welcome one and all to the Arcane Space Tileset=- This Tileset will give you the opportunity to play the SpellJammer setting with Neverwinter Nights. 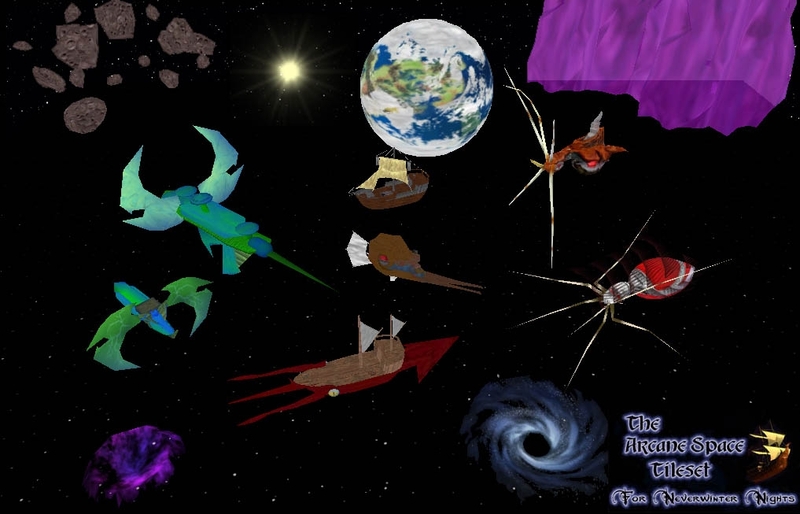 The mini adventure module takes you on a voyage from the shores of lake Nyr Dyv on the planet of Oerth, through the atmosphere, and finally to Wildspace, where you will navigate one of seven SpellJammer types to the atmospheric world of Gnible. To begin the quest, speak with your old friend Taengelen Elderbower for full instructions. Please see the Readme file at: http://www.mysticnexus.com/ArcaneSpace/ReleaseNotes.txt For a thorough description of this tileset. A very Merry Christmas from the Arcane Space Tileset team, to everyone! :) Mystic FN: This Hak Pak contains both Hi-Res DDS, and Low-Res TARGA texture files for maximum system compatibility. A special thanks to Hellfire for uploading this to the Vault.